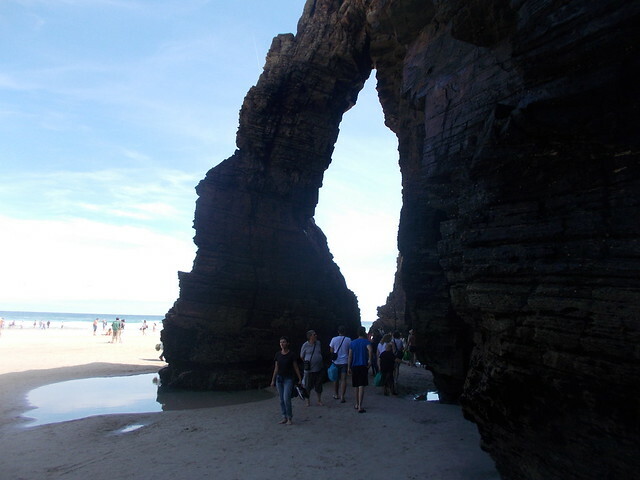 I first heard about the Playa de las Catedrales (Praia de As Catedrais in Galician, the Beach of the Cathedrals in English) back in 2012. I was immediately fascinated by it and wanted to go. I originally planned my November holiday around seeing it that year, but ended up staying in Asturias and exploring it more. 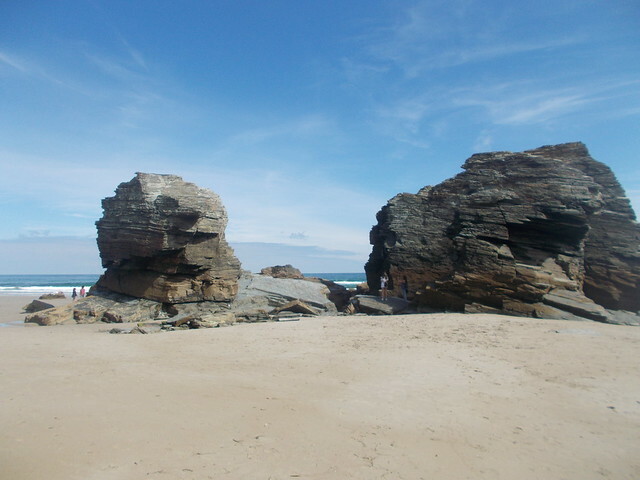 Me dijeron sobre la Playa de las Catedrales (Praia de As Catedrais en gallego) en 2012. Me fascinó desde el principio y quería ir cuanto antes. 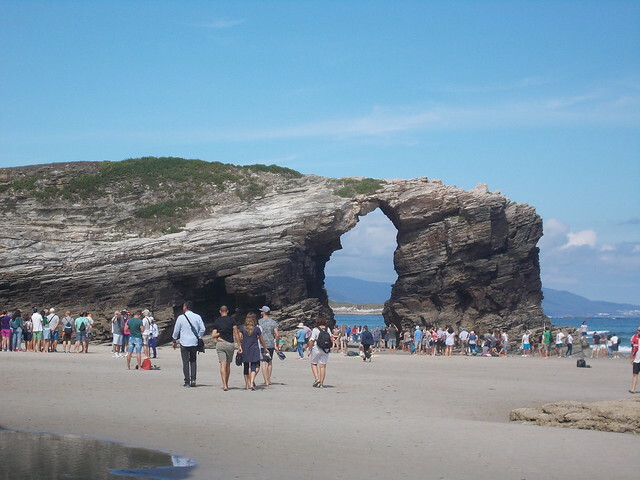 Mi plan para mis vacaciones del puente de Noviembre en 2012 era visitar la Playa, pero al final me quedé en Asturias para conocer Asturias mejor. Five years later, I finally got to go. 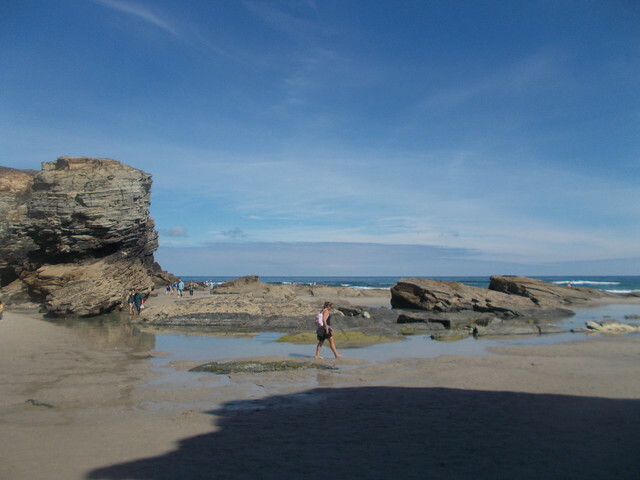 In fact, I planned my Camino del Norte to end in Ribadeo to be able to visit the beach of the holy waters. 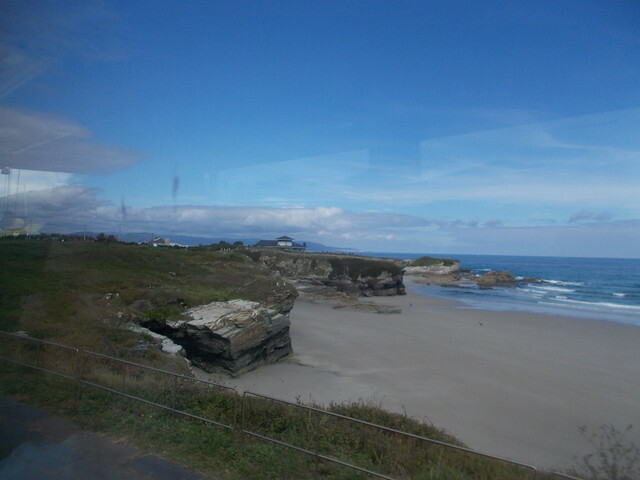 (The official name is Praia de Augas Santas). Cinco años después, por fin pude ir. De hecho, planifiqué mi Camino del Norte para terminar en Ribadeo para poder visitar la Playa de Aguas Santas (el nombre oficial es Praia de Augas Santas). When they told me about the beach, it reminded me of the famous Bay of Fundy beach in New Brunswick, Canada. 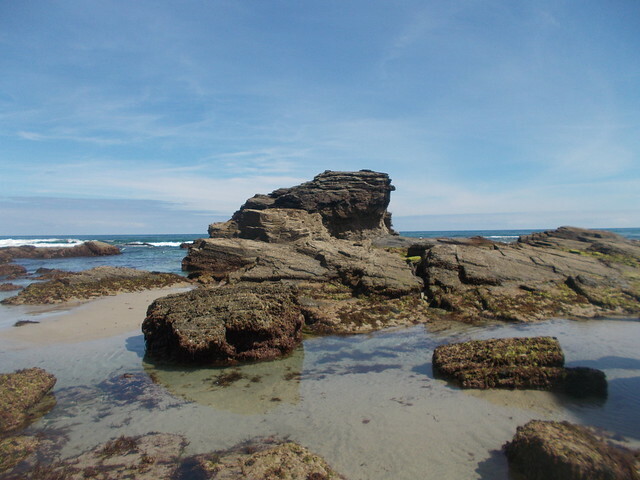 During high tide, it appears to be a small, rocky beach. 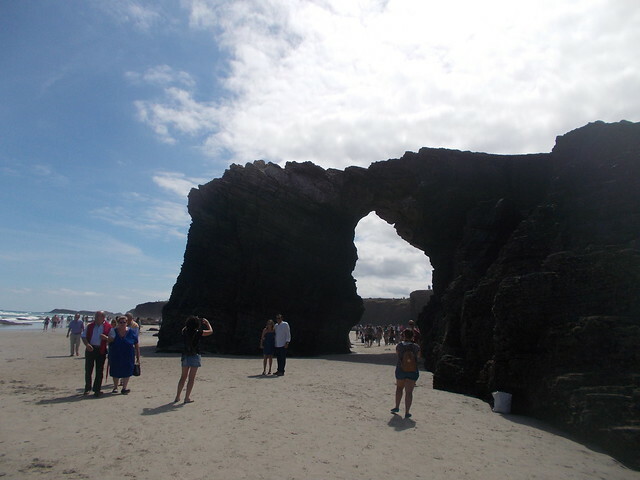 However, at low tide, you can see beautiful rock formations, or “cathedrals”, that every year attract more and more visitors. 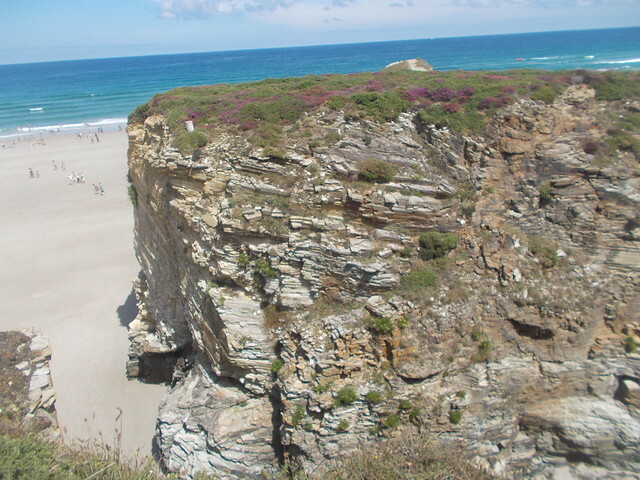 In recent years, during the summer, the beach can only be visited if you have a reservation, which is free and can be obtained at the Xunta de Galicia web site for the beach. Cuando me explicaron la playa, me recordaba de la playa de la Bahía de Fundy en Nuevo Brunswick, Canadá. 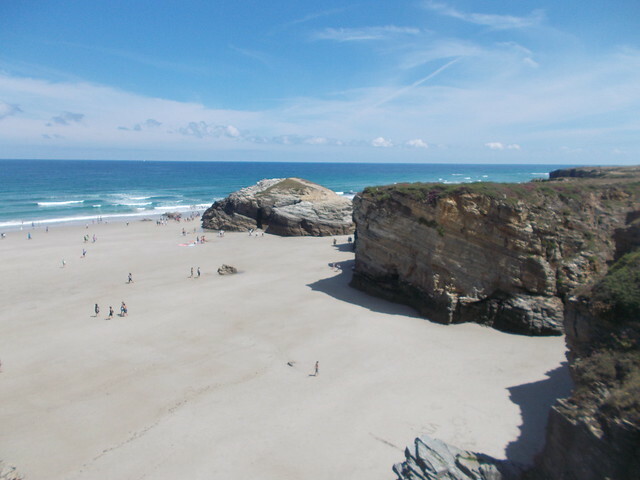 Durante la marea alta, parece ser una playa rocosa pequeña, pero durante marea baja, se puede ver formaciones de roca bonitas, o “catedrales”, que cada año atrae más y más visitantes. En años recientes, durante el verano, solo se puede visitar la playa si tienes una autorización, que es gratis y se puede conseguir en el sitio web de la Xunta de Galicia de la playa. 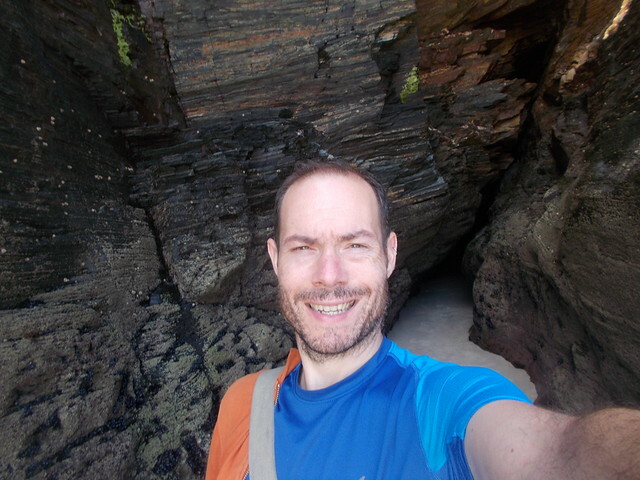 My original plan was to hike from Ribadeo, which is about 10 kilometres away. I was still in Camino mode, and it would have been a nice Route #29 for the year. However, after finding breakfast and a cash machine, it was a late start and the actual route is 16 kilometres. I wasn’t going to make it to the beach on time by hiking. El plan original era para caminar desde Ribadeo, que está a unos 10 kilómetros de la playa. Todavía estaba en modo-Camino, y sería una bonita Ruta #29 para el año. Sin embargo, después de encontrar desayuno y un cajero automático, ya era tarde y la ruta actual es 16 kilómetros. No iba a llegar a tiempo por caminar. 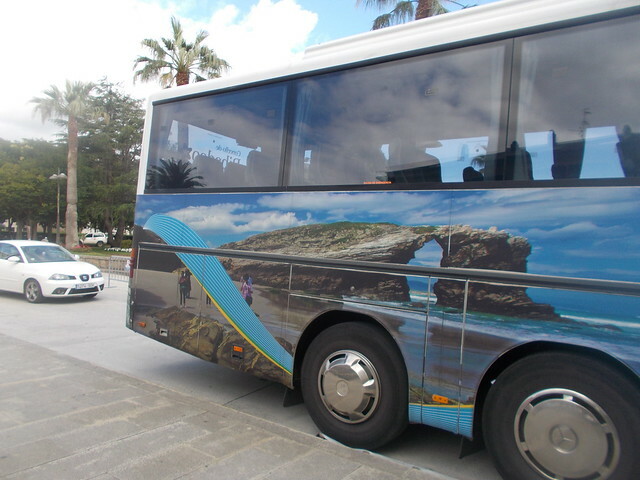 There is a bus that leaves from the tourist office in the main square of Ribadeo. It was 2.50 € return/roundtrip in 2017. 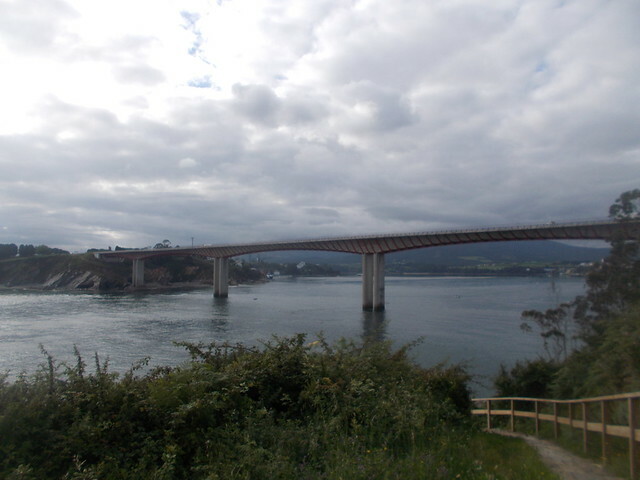 You can also arrive to a nearby village, Esteiro, on the FEVE train and walk the kilometre or so to the beach. There is also parking for cars. The bus timetable depends on the low tide. The timetable is posted outside the tourist office and is available online too. Hay un autóbus que sale desde la oficina de turismo en la plaza principal de Ribadeo. Costaba 2,50€ ida vuelta en 2017. También puedes ir a un pueblo cercano, Esteiro, en el tren de FEVE y caminar a la playa. Es sobre un kilómetro. También hay un parking para coches. El horario de autobuses depende en la marea baja. Pone el horario enfrente de la oficina de turismo y también está disponible en internet. There was a long queue of tourists waiting to get in. I was glad to see they were checking the authorizations. I’m not sure how many are issued a day. It seemed there were hundreds of tourists that day. 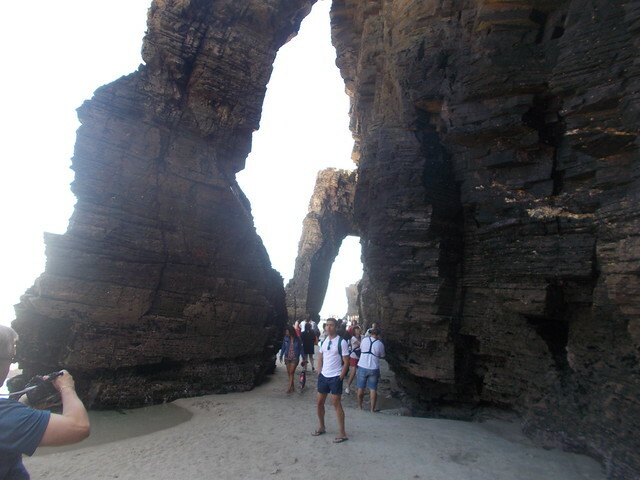 It was difficult to take photos of the more beautiful formations. Había una cola larga de turistas esperando entrar la playa. Me alegré que estuvieran comprando las autorizaciones. No sé cuantas dan cada día. Me parecía que había cientos de turistas este día. Era difícil hacer fotos de las formaciones más bonitas. 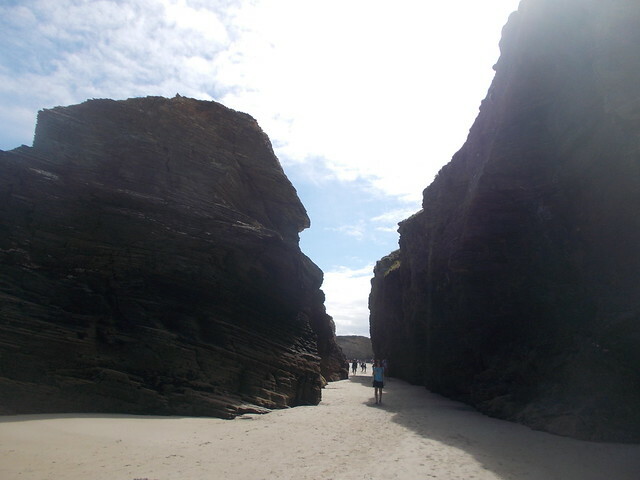 I wandered around the beach for about an hour and a half, enjoying the formations and meditating with the waves. It was amazing, although I’m not so sure it was worth five years of anticipation amazing. Hype tends to build things up in our mind. Paseaba por la playa durante sobre una hora y media, disfrutando las formaciones y meditando con las olas. Era impresionante, aunque no sé si merecía cinco años de espera para verla. La anticipación suele hacer las cosas más grandes. I had an expensive relaxing café con leche (2€) at the terrace café above before buying a Camino necklace and wandering around the cliffs tops. We had about two hours and 15 minutes to explore. Me tomé un relaxing café con leche caro (2€) en la terraza del bar antes de comprarme un collar del Camino y deambular por los acantilados. En total tuvimos sobre dos horas y 15 minutos para explorar la playa. I had lunch in Ribadeo and later caught the long, long (nearly two hour) bus ride to the capital Lugo, where my holiday would end. I didn’t know that the bad news of losing my summer job would be coming the following day. Ignorance is bliss! Comí en Ribadeo y después cogí el bastante largo (casí dos horas) autóbus a Lugo Capital, donde iba a terminar mis vacaciones. No sabía que me estaba esperando la mala noticia de perder mi trabajo de verano el día siguiente. La felicidad es ignorancia. Well considering it’s exactly two months later (wow, time flies! ), that new summer job never came about. But it is a great beach 🙂 Thanks for reading! fantanstico reportaje , me ha gustado mucho , es uno de mis sitios preferidos.